Group Discussion Ideas > Ethical GD Topics > Cattle Slaughter Ban – Right or wrong? Cattle Slaughter Ban – Right or wrong? On May 25th 2017, Central government banned the sale of cattle to slaughterhouses. And the only exception are farm owners. On 11th July 2017, Supreme Court suspended the ban across India citing that explanation is needed from central government for the cause of ban and told that livelihoods cannot be subjected to uncertainties. Central government is re-examining the rules and suggestions, and will recommend new changes by August-end. It is our responsibility to stop cruelty against animals. Article 48 of Indian constitution mentions that state should take steps in prohibiting the slaughter of cattle. Many slaughterhouses are not following the rules to not harass the animals while killing. Animals are subjected to intense suffering at most of the slaughterhouses. Cow is a sacred animal for Hindus. Killing cows hurts their sentiments. Many people are dying of hunger in India. Hunger and malnutrition are biggest problems India is facing right now. Beef is a cheap protein available to poor people. With the cattle slaughter ban, malnutrition problem worsens further. 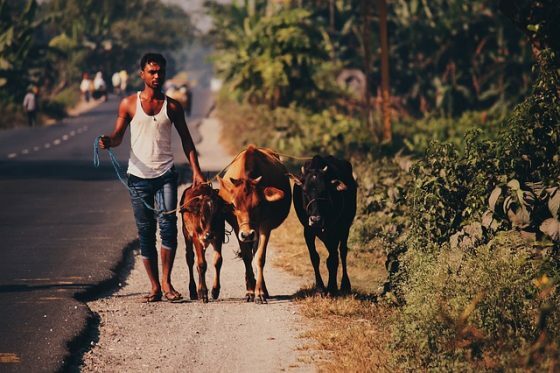 70% of the cattle in India is owned by marginal farmers. They cannot afford to maintain their cattle after the cattle stop providing benefits to farmers, like providing milk, dung etc. The only way for farmers is to sell these old animals to slaughterhouses. Over 22 million jobs are dependent on slaughterhouses. Cattle slaughter ban will cause of loss of their livelihoods. It is not ethical to interfere with food habits of others. Why only cattle? Why not a ban on chicken, goat meat an fish meat? Taking action against illegal slaughterhouses is a right step, but banning entire cattle slaughter may not be a right decision by central government. There are food security and livelihood security issues. It is the responsibility of the government to respect everyone’s choices equally. Afterwords :- Do you think cattle slaughterhouses should be banned? Express your thoughts in the comment section below. Subscribe to our blog to get new topics delivered to your mail. According to me cattle slaughter should be banned it’s right because of cow it’s an useful animal , from cow we get milk , milk is very nutritious food , most of the people takes milk especially small children have to take milk. Secondly from cowdung we get fertilizer , it is very important to make the agricultural and not only that nowadays from cowdung people set up to create solar energy and we everybody suffering from global warming and I e substitute of electricity solar energy required so we should take care of cow. So there is question of religious problem. Though we Hindu community worship cow as Go-mata so Government should take care to save the cow.